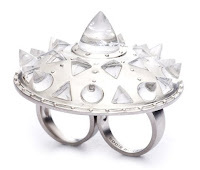 Two finger star ring, where have you been all my life? I know there has been some mild debate over the supposed demise of the stud, and I get it, they are everywhere, and each time you think they might go away, like the skull motif, they just keep coming back. Some studded pieces work better than others. And some, like the Eddie Borgo ring pictured, take my breath away. Eddie Borgo jewellery is available online at Liberty and soon My Theresa. You can also get it direct from the Eddie Borgo website.